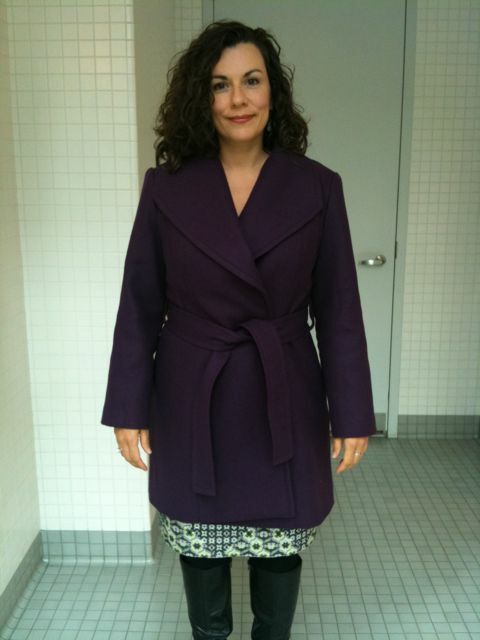 Overall, I am pleased as purple punch with this coat. I really took my time with the construction. I love the fabric and color. I love the pattern, Simplicity 2311; it’s really well drafted and the instructions are excellent! ﻿﻿﻿﻿I love the topstitching. I went through 3 and a half spools of Gutterman thread, but it was sooo worth it. With my structural additions of shoulder pads, sleeve heads, and interfacing, it really does feel like a real coat! After wearing it to work today, I might add some more hand stitching to the hem of the coat and maybe hand stitch in the ditch around the collars and shoulders where I am able to meld the two layers (the under collar and the upper collar) together better so they move as one. The only thing that could be improved on this coat is a personal label. I would love to order some, but just can’t decide on how my label should read. Sew A Beginner is too cumbersome (and not really accurate anymore). Sewn by Elizabeth seems so loving hands at home-y. I need something with a little more oomph and style. Any suggestions? Full review of this awesome pattern to come in the next couple of days. I need to take some more interior photos. Wow! It looks really fantastic. Nice job. Great color for you. It looks wonderful! For labels, how about Elizabeth in a font that you adore. Plain simple understated elegant…. Oh, I love it, that purple is hot!!! Gawgeous and the work was worth it! Totally Gorgeous.. now I want a purple coat. As for labels…I like Katie’s idea. What a great coat. I love the colour and it looks very professional. Nice! I think just ‘Elizabeth’ is a wonderful idea for a label. Love it!! Purple is a great color for you too – you should wear more of it! As far as a label, let me give it some thought. It needs to be something witty and cool. That looks wonderful! I want it! I have woven labels that just have my first and last name. I think they look pretty cool. How about your first name and last initial? Gorgeous coat, Elizabeth! You’re going to get a LOT of wear out of it this fall. That purple is just scrumptious. For labels, how about “Sew Chic”? I like just “Elizabeth”, too. You’re SO not a beginner any more! I just stumbled over your blog and well, was more than a little bit astonished … I made this coat one week ago. And I did use the same collar. And I didn’t use buttons. And I did use a dark purple . oh your coat looks AWESOME! I love it. Maybe you could get a simple label that just says “Elizabeth L*son New York” like the couture people do. Like Paco Peralta has. Your coat is a triumph! The cut, the colour, everything looks great and great on you. I agree with the others a label just saying “Elizabeth” would be chic. I love your coat, it looks wonderful on you. Also love the color. I cannot wait to see more pics of this – the preview is so tantalizing! Gorgeous, love the color. Perfect job. Labels are so difficult, I want them too and can’t decide what should be on them. So not suggestion, but I’m reading the other suggestions with interest. I reckon “Lizzie Singer” as a nod to both your former life and some of your machines. Fantastic coat, it really looks good and I look forward to seeing more detailed pics soon. I hear you on the labels, the same thing has stopped me buying any yet. Really lovely coat. A job well done. I really love your work. I also think those two knit dresses with the prints are so you! I really love them on you and I think colour suits you (I’m not a fan of the darker blues but each to their own as they say). No designed by or created by and not just Elizabeth, but Elizabeth with a stylized Z.
I’m thinking of getting labels from the company Lindsey T used. I admire her label. The coat is beautiful. What a great color. Oh I missed this post – you finished it so quick! It looks amazing, you’ve done such a beautiful job, and I love the colour on you! That looks so professional and it really suits you. Just lovely. What a lovely job! I thought I commented already but it seems not… It’s such a pretty fall coat! The colour’s so luxurious and warm-looking, and incredibly flattering on you. Gorgeous! I agree with the label suggestion of just ‘Elizabeth’ – it’s timeless and you won’t get tired of seeing it!